SAN DIEGO, CA--(Marketwired - June 19, 2014) - Envision Solar International, Inc. (EVSI) ("Envision Solar," or the "Company"), the leading Renewable Energy Media and Branding product company, announced today that its EV ARC™ product was the featured EV charging solution at CCSEs Alternative Fuel Event. CCSE helps individuals, businesses institutions and governments with planning, technical assistance, education and incentives in the areas of building performance, renewable energy, distributed generation, energy storage and clean transportation. CCSE also manages California's Clean Vehicle Rebate Program. The event was held to educate businesses and governmental agencies about the most effective ways to manage the rapidly growing requirements for electric vehicle infrastructure. The event took place at CCSE's headquarters, which is managed by ARDEN Realty, Inc., a GE Capital Real Estate Company. "Having a transportable, solar powered EV charging station at this event was the perfect way for us to demonstrate the latest in environmentally sound and efficient EV charging to the attendees," said Kevin Wood, Project Manager of Clean Transportation for CCSE. "It was easy to deploy and I think everyone got a great deal of value from it beyond simply charging their EVs." "CCSE is an important thought leader and enabler for clean transportation," said Desmond Wheatley, CEO of Envision Solar. "They attract a very high quality of attendee and we were delighted to have the exposure for our product at this event. People were waiting in line to use EV ARC™ so they could experience driving on sunshine. It was clear to everyone there that this is a powerful and compelling product." Invented and manufactured in the US, the EV ARC™ fits inside a parking space and generates around 16kWhrs/day that are stored in the on-board batteries. The system's solar electrical generation is enhanced by EnvisionTrak™, which enables the array to follow the sun, generating 18 to 25% more electricity than a fixed array. According to a new report from Navigant Research, the states of California, New York, Washington, and Florida will lead the United States in annual sales of PEVs through 2022. Envision Solar, www.envisionsolar.com, designs, manufactures and deploys unique, architecturally accretive, renewably energized, EV charging and Media and Branding systems with a Drag & Drop Infrastructure™ product line. The company's products include the patent-pending EV ARC™, the patented Solar Tree® and Solar Tree® Socket™ arrays with EnvisionTrak™ patented solar tracking, SunCharge™ Column Integrated Electric Vehicle Charging Stations and ARC™ technology energy storage solutions. Based in San Diego the company integrates the highest quality components into its Made in America products ensuring long and trouble free service and timeless beautification of the locations they serve. 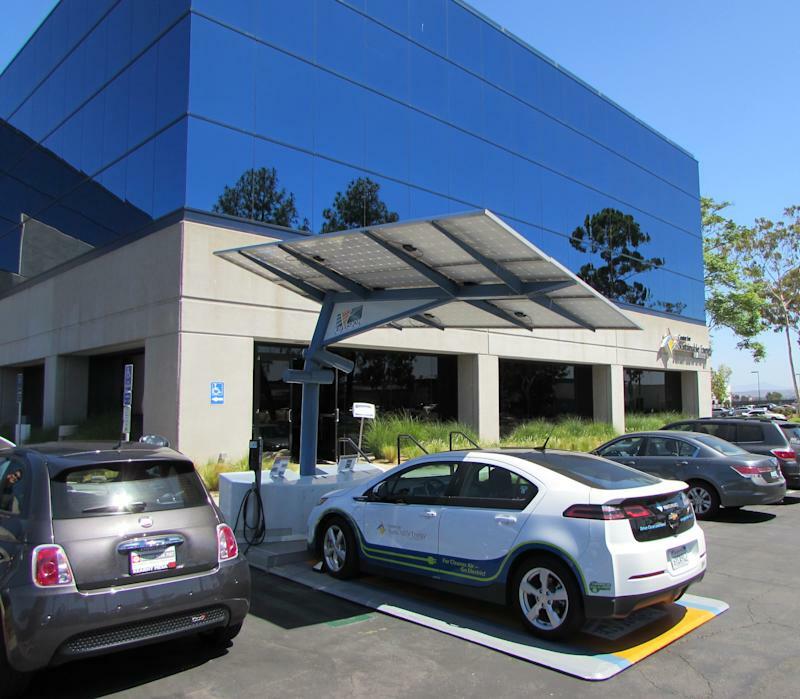 This unique approach enables the company's commercial and institutional customers to take full advantage of the value creation associated with transforming underutilized locations into beautiful, shaded, renewable energy generation plants, which support Media and Branding, EV Charging, and are shrouded in the "Green Halo." Envision Solar is listed on the OTC Bulletin Board under the symbol [EVSI]. For more information, visit www.envisionsolar.com or call (866) 746-0514.